Nvidia's Shield will officially launch in early June - note that the "project" part of the name is no more - with pre-orders going live on Nvidia's site on May 20, priced at exactly $349 (around £230/AUS$350). For those unaware of what the Shield actually is, this isn't some sort of military-grade GPU - it's Nvidia's first ever game system, announced at CES 2013. 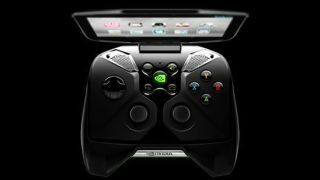 The Tegra 4/Geforce powered device can play high-powered Android games as well as PC and Steam titles, all of which will be streamed to the device's dinky 720p controller screen. It's good to see Nvidia making good on its release-window promise. We did wonder, however, if it might give the handheld a whole new moniker entirely, rather than just chopping off the "project". It also looks the like the design we've all become accustomed to has become concrete, with no signs of any last-second tweaks. The console will go up against the Nintendo 3DS and PlayStation Vita - though it doesn't really offer the same portability - but also hopes to shake up the way PC gamers play. Of course, we're very much expecting a full global rollout to take place and have asked Nvidia what its plans are. We'll let you know as soon as we hear back.